The color picker system automatically converts a spot color to the closest CMYK values by directly reading a color chip. It will compute CMYK values based on printer / media properties and allow an operator to check ΔE*. The color picker system is equipped with the PANTONE Color Library. MimakiProfileMaster II i1 Pro Set: A colorimeter for color matching. "Caution" will appear when ⊿E is over 5.0. A preview function to check the output quality. An approximate color will be selected when ΔE is below 2.0. When a print head is replaced, colors can differ slightly. The printer calibration detects and adjusts for such differences to maintain color consistency. *color differences are measured based on ΔE. Measuring the ΔE with a colorimeter. Comparison of ΔE values between two or more colors. Equalization helps to create color consistency between the same types of printers. It allows quick response to an urgent or bulk order by running several printers simultaneously. Equalization minimizes color differences between the same type of printers. With Mimaki Profile Master II, making a high-quality ICC device profile is easy. ICC device profiles enhance and standardize printer output for all printing materials and inks. A wizard guides the user to easily create ICC and other device profiles. Mimaki Profile MasterII Patch updater for Windows 10 April 2018 Update is posted. 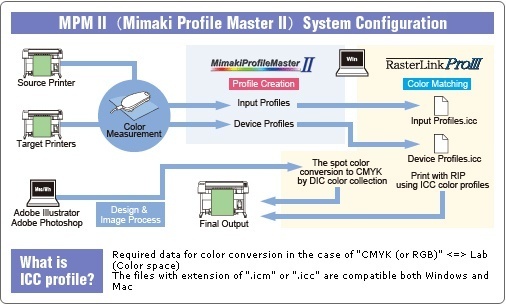 Mimaki Profile MasterII Update Tool v4.190 is posted. Mimaki Profile MasterII Update Tool v4.180 is posted.